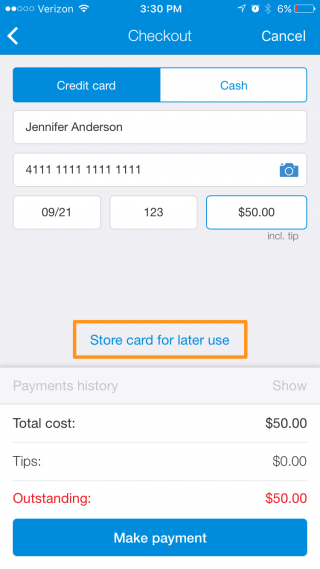 Learn about Genbook Manager's POS/Checkout feature on iPhone. 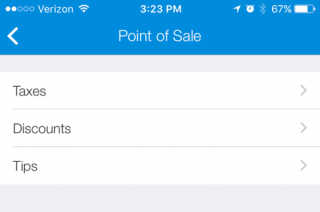 The Genbook Manager app is equipped with awesome Point of Sale (POS)/Checkout options! Before we dive into these features, make sure you have enabled Payments and connected your Stripe account via the Genbook desktop site. In the Manager app on your iPhone, tap the gear icon at the top left to access your full Settings menu. 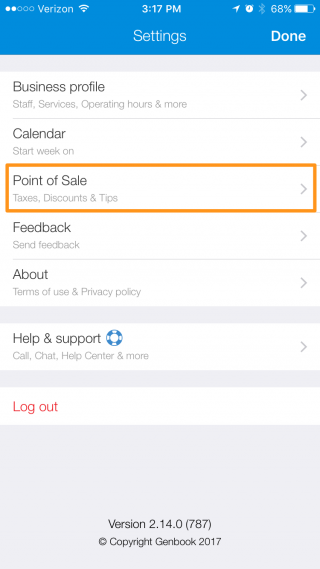 You'll see the Point of Sale settings between "Calendar" and "Feedback". 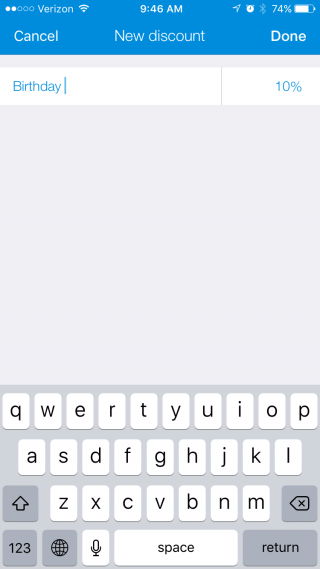 Once you tap on that, you'll reveal the options for that feature. First, you have the choice of including taxes within your service costs. 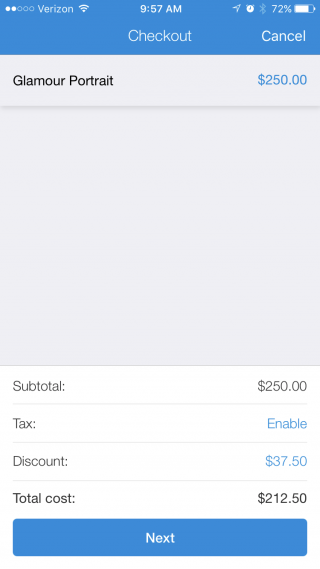 Enable this if your existing service cost already accounts for tax. The tax will not be added on top of the price listed, but calculated as part of it. 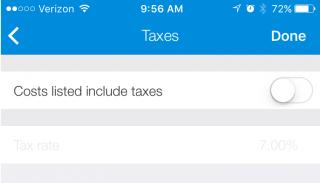 If your service costs don’t include tax, keep this setting off/disabled. You can also create a number of discounts that can then be applied to individual appointments. Just tap “Discounts” and then the plus sign (+) at the top right of the following screen. Next, give your new discount a name for easy reference and assign the percentage you’d like it to take off the service price. Once you hit “Done” at the top right, you’ll then see a list of all the discounts you’ve listed. 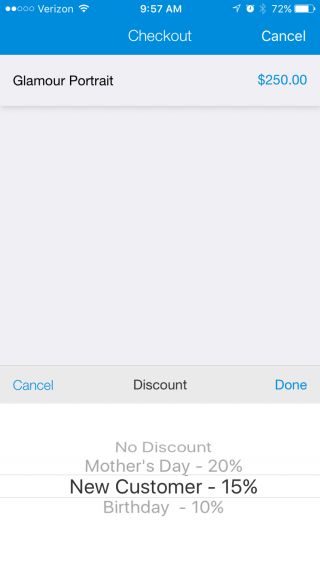 If you need to delete a discount, swipe left across it and tap the red “Delete” button. Finally, you can choose whether or not to enable tips. 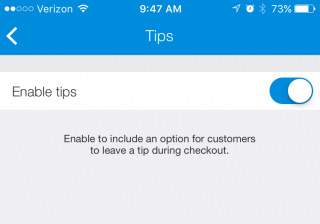 Enabling tips means that you’ll have the option to let clients leave a tip when they’re checking out. Now that you’ve set your POS preferences, let’s have a look at the Checkout process. 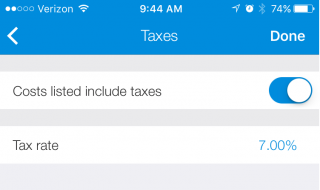 On the next screen, you’ll see the option to account for tax (again, within the service price, not in addition to it). You can choose to also apply a discount to the cost of the appointment. 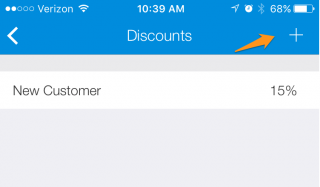 To add a discount, tap “Add”, and then select the discount you want to apply. Then, tap “Done”. You’ll then see the discount and an updated “Total cost”. On the next screen, you can let your customer choose whether to submit a tip. They can choose a fixed percentage of the cost. Once the tip has been applied, it’s time to charge your client. You have the option to charge their credit card or enter a cash payment. You can manually enter the card number, expiration date and CVV (code on the back). There’s also the option to capture a picture of it with your phone’s camera (just tap the camera icon in the “Credit card number” field). If the client entered a card number at the time of booking, that card will appear there. You have the option to take partial payments on multiple cards, by simply changing the amount listed beside the CVV field. You also have the option of taking all or part of the payment in cash, and simply keeping a record of it in the Manager app. 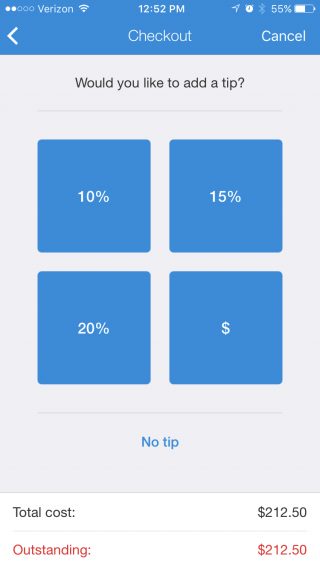 Tap “Cash” and, if the amount is the same as what’s “Outstanding”, tap the blue “Make payment” button at the bottom. Once you’ve collected a payment either via credit card or cash, you’ll see a screen that alerts you the payment’s been taken. 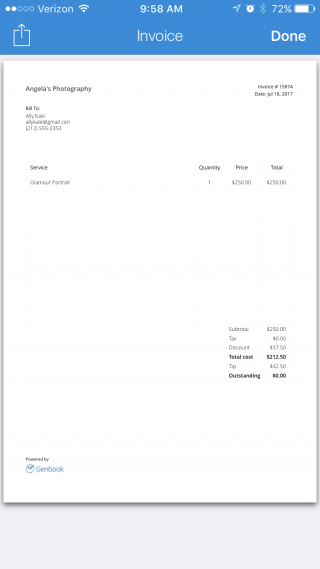 You will also be able to see the invoice as well as send it to your customers. You’ll see the payment history, including any cards that were used in the transaction (only the last four digits, of course). 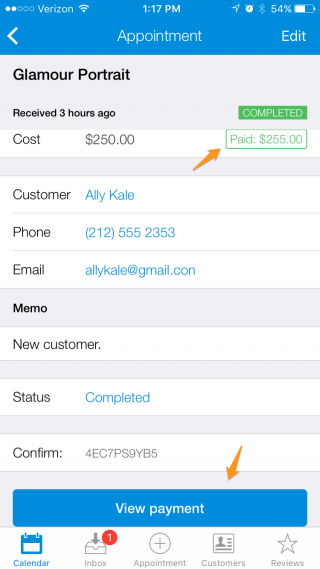 Tap “View invoice” at the very top left. 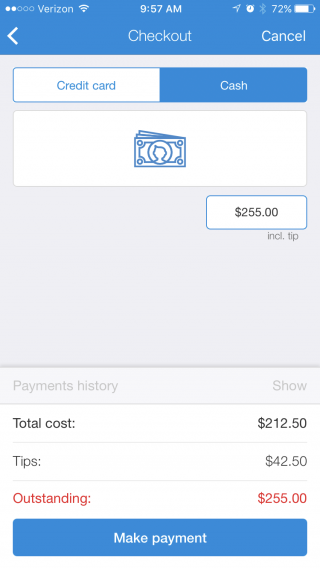 You’ll see a copy of the invoice you’ve just generated by collecting a payment. You can then export/send it to yourself using the export icon at the top left. Once you’re finished, tap “Done” to return to the Checkout screen. 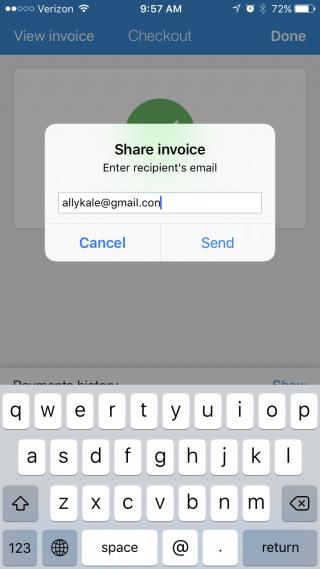 On the Checkout screen, tap the “Share invoice” button to send the invoice to your client’s email address. 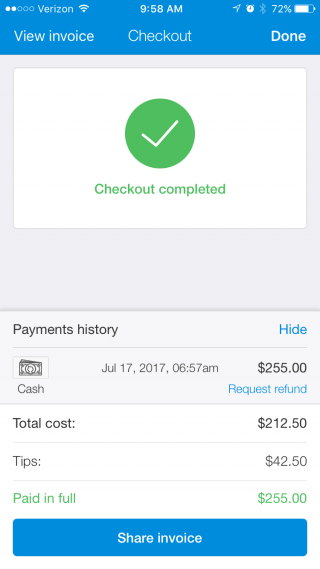 Once you’ve finished the checkout process, you’ll be able to see a record of it on the appointment’s details by tapping “View payment” (the button will have replaced the previous “Checkout” one). You’ll also instantly see that the appointment has been paid for, next to the cost. You can also use the Checkout and POS features to collect a client’s card details after you manually enter an appointment using the app, without charging them. On the Checkout / Make Payment screen, instead of tapping “Make Payment”, tap the “Store card for later use” link. That will validate and save the card so that when you do come back to charge the client, their card will already be there and you just have to ensure you’re collecting the right amount.